Horrific video shows dead and dying after alleged chemical attack by Assad's forces near Damascus. At least 635 people have been killed in a nerve gas attack on Syria’s Eastern Ghouta, activists at the Local Coordinating Committees told Al Arabiya on Wednesday morning. Other news sources cited lower numbers of deaths. Hundreds of others were reported wounded in the attack on rebel-held areas of eastern Damascus. According to Al Arabiya, the activists at the Syrian Revolutionary Command Council said Syrian fighter planes were flying over the area after the bombardment. They accused the forces loyal to President Bashar al-Assad of using chemical agents. 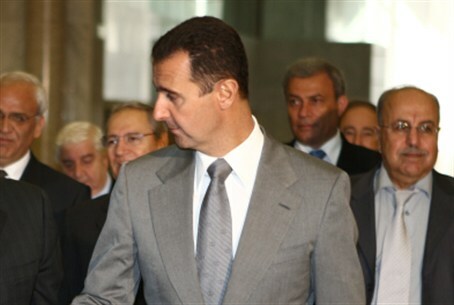 The news coincides with a visit to Damascus by a United Nations team of chemical weapons experts. Activists from the grassroots Local Coordination Committee initially reported at least 30 bodies had been brought to one field hospital in Kafr Batna neighborhood a few miles east of central Damascus. Meanwhile, the Syrian Observatory for Human Rights said dozens of people were killed, including children, in a fierce bombardment. Activists at the Local Coordinating Committees said Mouadamiya, southwest of the capital, came under the heaviest attack it had experienced since the start of the two-year-old civil war. Al Jazeera quoted Syrian activists who said at least 213 people, including women and children, were killed on Wednesday in a nerve gas attack by al-Assad's forces on rebel-held districts of the Ghouta region. The death toll was collated from medical centers in the region, Bayan Baker, a nurse at Douma Emergency Collection facility, told the network. The Syrian government denied using chemical weapons, calling the reports "completely baseless," the state-run SANA news agency said. CNN quoted a person it identified as "Dr. Abu Said at a field hospital in Sakba, east of Damascus," who said the injured began streaming in to the hospital shortly after pre-dawn prayers. Of the 200 casualties, 40 were pronounced dead. The symptoms, he said, included unconsciousness, foaming from their nose and mouth, constricted pupils, fast heartbeat and difficulty breathing. The ones who died had asphyxiated, he said. While the international community has accused al-Assad of using chemical weapons in the past, his Russian allies were quick to defend him and said that the rebels were the ones who used sarin gas. The horrific videos embedded appears to show dead and dying people, including children, allegedly after the chemical weapons attack. Arutz Sheva has not been able to verify when and where the videos were shot. Additional video that has reached Arutz Sheva's news desk is too disturbing to show our audience.